ViaSat-2 is an ultra-high throughput broadband satellite built by Boeing Space Systems and operated by California-based ViaSat to join the company’s Ka-Band satellite fleet connecting households, businesses and airplane passengers to high speed Internet services. It is the second ViaSat satellite to launch and, when reaching orbit in mid-2017, will be the highest-throughput broadband satellite in operation. Since its launch in 1986, ViaSat grew into one of the world’s leading telecommunications providers, initially starting out in the development of ground-based communications infrastructure as well as modems, IP terminals and high-frequency broadband systems for satellite communications. 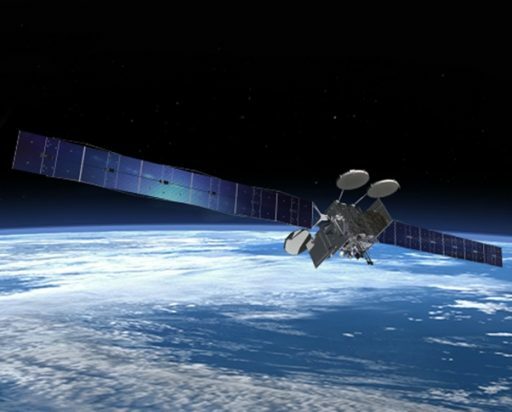 In their first two decades of operation, ViaSat acquired a number of specialized technology companies to develop bandwidth efficient high-data rate solutions for satellite communications and high-performance IP terminals for multimedia networks provided by Fixed Satellite Services spacecraft. ViaSat partnered with WildBlue in 2001 to build satellite modems while WildBlue acquired the space segment via transponders on the Anik F2 satellite to enter operational services for U.S. customers in mid 2005, later adding the WildBlue-1 satellite to increase its customer base. Through additional acquisitions, ViaSat began developing video data link equipment, encryption technology and microwave circuits and antennas for terrestrial and mobile satellite applications. WildBlue was acquired by ViaSat in 2009 for $568 million, giving the company its first two satellites – Anik F2 and WildBlue-1 – and 400,000 Internet customers. ViaSat-1, ordered from Space Systems Loral, launched atop a Russian Proton Rocket in October 2011 and was the highest-throughput satellite placed into orbit at the time with a total capacity in excess of 140 Gigabits per second dedicated to expanding ViaSat’s market in North America with coverage provided by 63 spot beams over the U.S. including Hawaii and Alaska and nine beams over Canada. 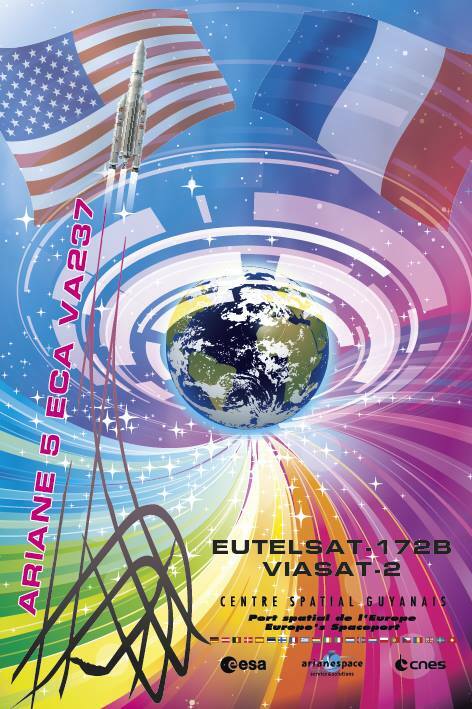 ViaSat-2, set for liftoff atop an Ariane 5 in June 2017, will double the network capacity and deliver seven times the coverage of its predecessor, taking a spot further east to cover the entire continental U.S., the Caribbean and bridging the gap over the Atlantic to provide seamless broadband coverage to aeronautical and maritime customers in cooperation with European telecom services provider Eutelsat. 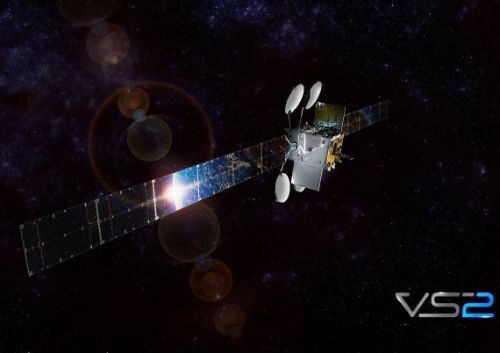 ViaSat already announced plans for the future, intending to launch a constellation of three ViaSat-3 spacecraft to provide global Internet distribution. The ViaSat-3 spacecraft each will support a throughput of one Terabit per second and operate as a globe-spanning constellation with a fourth satellite expected to follow in the 2020s to reinforce coverage and add redundancy. Two of the satellites were ordered from Boeing in July 2016 and are expected to launch on Ariane 5 and Falcon Heavy rockets in 2020. 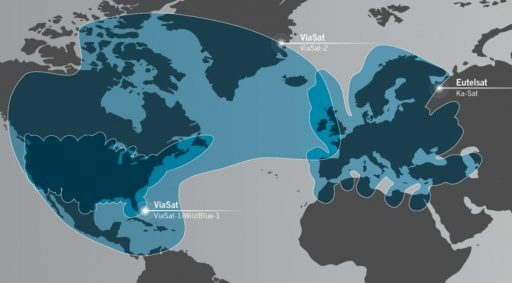 ViaSat-2 – a $625 million project – will further the company’s overall vision of advancing global connectivity beyond what traditional telecom, wireless, cable or fiber could deliver and making the Internet available and affordable across the globe. The ViaSat-2 satellite system was designed with high flexibility in mind, capable of directing coverage where it is needed when it is needed. 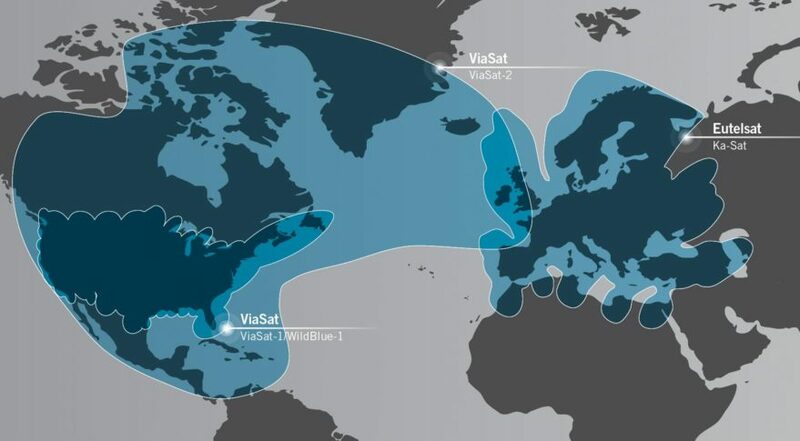 ViaSat says the newest addition to their fleet will bring an abundance of capacity which, coupled with state-of-the-art ground networks and industry-best bandwidth economics, can improve speeds with an in-orbit cost for capacity that is considerably lower than the competition. 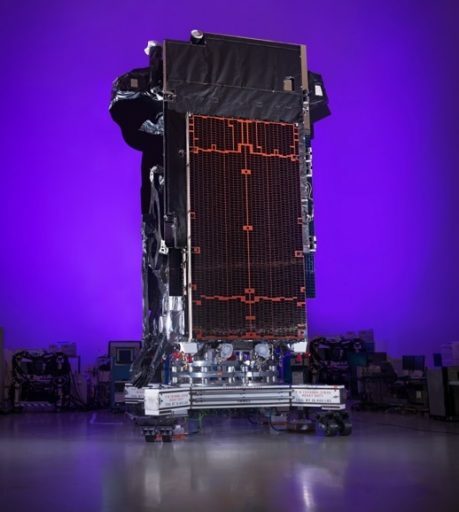 ViaSat-2 was ordered from Boeing in May 2013 and is based on the flight-proven BSS-702HP satellite platform that can host the most powerful communications platforms currently in service. The satellite’s high-capacity Ka-Band terminal will support a data throughput of over 300 Gbit/s via high-performance spot beams that can be placed within a coverage area seven times that of ViaSat-1. The 6,418-Kilogram satellite is expected to operate for 14 years or more from an orbital position of 70 degrees West where it can cover the Americas, the Caribbean and a large stretch of the Atlantic Ocean. ViaSat-2 measures 6 by 3 by 2 meters in its stowed configuration and, once close to its operational orbit, deploys a pair of solar arrays that span 48 meters from tip to tip. ViaSat initially booked the satellite on a SpaceX Falcon Heavy rocket for launch in late 2016, but persistent delays to the rocket’s debut mission made it unlikely the satellite could stay anywhere close to its original timeline if sticking with the new heavy-lifter. As the satellite is a criticality in ViaSat’s future business development, the company shifted launch services providers and placed the satellite on the Ariane 5 rocket with a launch date in April 2017 which ended up slipping six weeks due to a social unrest at the Guiana Space Center. 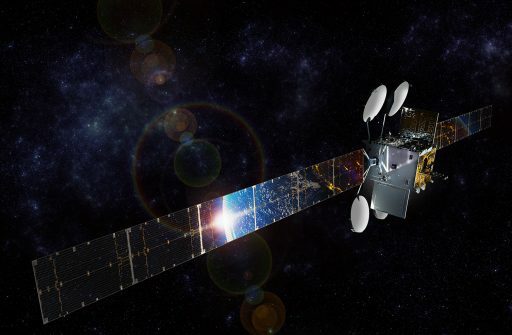 ViaSat-2 will be able to support a number of different services including fixed and mobile services, in-flight connectivity, maritime, emergency relief, oil and gas operations, and secure government applications. ViaSat-2 is based on Boeing’s BSS-702HP satellite platform, the high-power configuration of the 702 bus that can support the most powerful communications payloads with state of the art onboard systems including precise pointing capability and the use of flight-proven components and built-in redundancy to ensure the satellite meets its in-orbit lifetime of 14+ years. The two deployable solar arrays each have six wings that are covered with ultra triple-junction gallium-arsenide solar cells that deliver a beginning of life power of 18.2 Kilowatts decreasing to 16.1kW at the end of the satellite’s service life. Power is stored in dual Lithium-Ion batteries and dedicated avionics regulate the main power bus of the spacecraft to provide power to all subsystems of the satellite bus and the communications payload. ViaSat-2 employs a hybrid propulsion system with traditional chemical propulsion for the initial climb toward Geostationary Orbit and electric propulsion for orbital fine-tuning and stationkeeping maneuvers. The satellite is equipped with a bipropellant Liquid Apogee Engine that is used for the initial climb to Geostationary Orbit. In addition, the satellite uses four axial 22-Newton Thrusters and four radial 10-Newton thrusters for smaller orbit adjustments, drifting in Geostationary Orbit and attitude maneuvers. 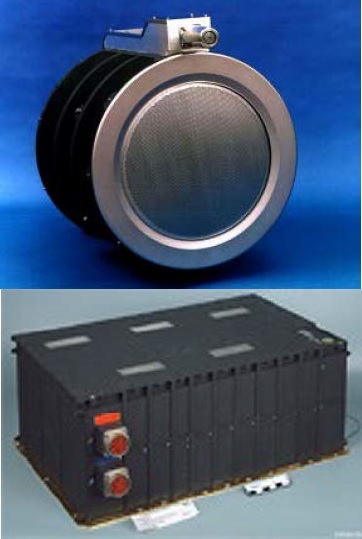 The XIPS-25 system used by the 702 spacecraft consists of a central Xenon tank and four 25-centimeter ion thrusters. Required power varies between 1,300 and 4,500 Watts achieving a thrust of up to 165 Millinewtons and a specific impulse of 3,500 seconds. Two of the four thrusters are used as primary units at any given time and stationkeeping in Geostationary Orbit will require four burns for a total of about 30 minutes per day to maintain the satellite within a 0.01 degree stationkeeping zone which allows many satellites to be collocated in a single orbital slot.